Scott's Ponies and Amundsen's Dogs immortalised in the Southern Skies. ← Lawrence Oates – Sacrifice Or Suicide? Ponies And Dogs Of The Southern Sky. Scott’s Ponies and Amundsen’s Dogs Immortalized. Southern Aeronautical Waypoints named in their honour. The names of the many great Antarctic explorers of the Heroic Age, are well known, widely documented and duly remembered. 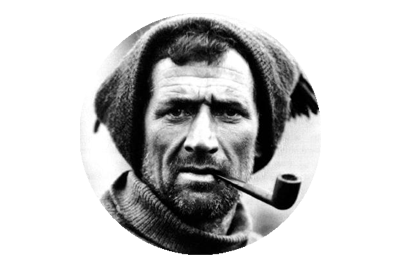 The feats of Amundsen, Scott, Shackleton, Worsley, Crean and Wild, to mention but a few, still evoke passion, admiration, pride and indeed much discussion and debate. 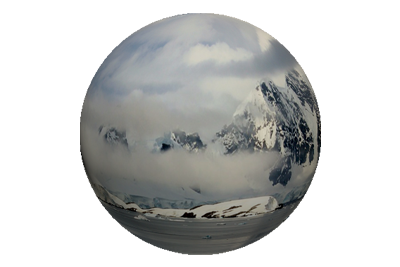 The map of Antarctica is very much comprised of landmarks and features named by, or in honour of these great pioneers. As was the wont of the great explorers who first tread unseen lands, they named every natural anomaly they discovered, as they so wished. The names chosen tended to stem from the royalty of the day, expedition sponsors, previous expeditions, explorers and crew, and of course those near and dear to them. But nowhere, or no place on the vast white continent was named after the animals that played such a crucial role in each and every southern expedition. Nowhere that is, until one man decided to address the issue, and have the contributions of the canine and equine contingents remembered. Because international rules prohibits the naming of Antarctic landmarks after animals, Col. Ronnie Smith of the US Air Force, turned to an area of Antarctica that he was very familiar with – the skies above. Ronnie J. Smith was born of U.S. Air Force parents in Udine, Italy, and grew up in Baltimore, Maryland. He attended Loyola College (B.A.) and the University of Maryland. Ron entered the U.S. Air Force in 1983 to fly C-130 aircraft and has traveled the world as a professional aviator. After many years flying in the polar regions, he was selected to be the in-theater commander of Operation DEEP FREEZE, the DoD logistics support to the U.S. Antarctic Program from 2005-2008. 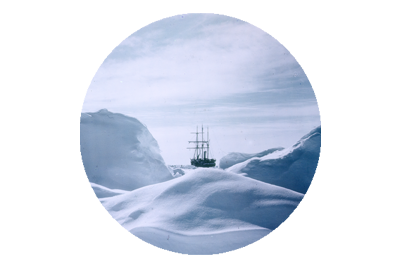 “I can tell you that these men were quite an inspiration to me and many others who lived and worked in both north and south polar climes. We walk on their shoulders.” That was Ronnie’s thought on the men of the heroic age, in a correspondence, earlier this year. Of the animals that toiled alongside these men, Ronnie said in an article for Equus Magazine, “The animals never got their due credit. There’s a statue around here and there. And as a poet, I saw this as not just a heroic/romantic period of history, but one of neglect for the animals who made it possible for the success of the brave men. They literally could not have done it without the animals. They did not have the technology.” Ronnie lobbied for two years to have the dogs and ponies of Amundsen and Scott’s expeditions remembered, by naming Aeronautical Waypoints in their honour. It was not an easy task. He first needed the agreement of The U.S. Air Force, the U.S Department of State, New Zealand Air Traffic Control and the National Science Foundation. Once they were all on board, Smith had to research the animals and develop the waypoint names, which are all 5 charecters long. Prior to his success all the waypoints were named by random computer generated, five lettered words. As a result, maps of the route, of almost 2,100 miles, used by all air traffic between New Zealand and McMurdo Station in Antarctica will bear the names of six of Amundsen’s sledge dogs and five of Scott’s ponies. Waypoints are sets of coordinates that identify a point in physical space. Coordinates used can vary depending on the application. For terrestrial navigation these coordinates can include longitude and latitude. Air navigation also includes altitude. Waypoints have only become widespread for navigational use by the layman since the development of advanced navigational systems, such as the Global Positioning System (GPS) and certain other types of radio navigation. Waypoints located on the surface of the Earth are usually defined in two dimensions (e.g., longitude and latitude); those used in the Earth’s atmosphere or in outer space are defined in at least three dimensions (four if time is one of the coordinates, as it might be for some waypoints outside the Earth). In aviation, area navigation (RNAV)—a method of navigation that permits aircraft operation on any desired flight path within the coverage of station-referenced navigation aids or within the limits of the capability of self-contained aids, or a combination of these—relies heavily upon waypoints. RNAV is increasingly used as the primary method of navigation for aircraft. In the RNAV context, a waypoint is a predetermined geographical position that is defined in terms of latitude/longitude coordinates (altitude is ignored). Waypoints may be a simple named point in space or may be associated with existing navigational aids, intersections, or fixes. A waypoint is most often used to indicate a change in direction, speed, or altitude along the desired path. So which of the animals were chosen? Bearing in mind that Scott brought 19 ponies with him on the Terra Nova Expedition. Many of the unfortunate beasts would die on the first season’s depot laying journey, but 10 would depart on the Southern journey, on November 1st 1911. Lawrence Oates was the chief pony handler on Scott’s expedition, and had to work tirelessly, both prior to, and during the march south, as the animals struggled in the harsh Antarctic environment. Once Scott and his team had crossed the Barrier (Ross Ice Shelf) and reached the foot of the Beardmore Glacier, it was quite literally the end of the road for the ponies, Climbing the 120 mile crevasse ridden glacier was never going to be an option for the animals, and those that had survived thus far, were reluctantly shot. Their meat was cached, to be accessed by the men on their return journey. Whilst callous sounding in it’s retelling, the decision to dispose of the ponies, had always been factored into the Scott’s plans, and all of the men were aware of the eventuality. However it was not without great sadness and utmost reluctance, that the men carried out this final act. Many tears were shed too, but ultimately the animals were free of the misery and labours they had so bravely endured. Roald Amundsen, meanwhile had opted to use sled dogs, for his attempt to reach the pole before Scot. He left his base, “Framheim” on 19th October 1911, with a total of 52 dogs. Amundsen’s dogs at the South Pole. Many of the animals were shot along the route, and their meat used to sustain the other dogs, and the odd prime cutlet was also consumed by the men. After successfully reaching the South Pole, arriving there 34 days before Scott’s team, Amundsen returned to his base on January 25th 1912 with a total of 11 surviving dogs. Ironically, by international agreement, dogs are now banned from Antarctica, as it was discovered in the 1980’s that they spread distemper, which can prove fatal to the indigenous seal population. So when it came to a selection process Ronnie J Smith had no shortage of candidates. Lynne Cox, an American author, who was writing a book on Amundsen, at the time, helped compile a list of names for all 52 of the dogs, and of those that survived the round trip. From this Ronnie eventually chose Per, Helge, Lasse, Mylius, Fritjof and Uroa. Of the six dogs chosen, all of them made it to the pole, but only Mylius and Uroa would complete the entire journey. 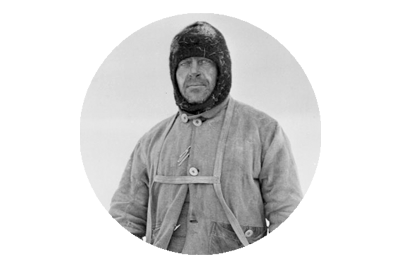 Helge reached the pole, but was extremely weak and dying, and was killed shortly afterwards. Per, Frithjof and Lasse, survived a little longer, but all were killed on the return trip. Two of Roald Amundsen’s favourite dogs – Fix and Lassesin. When it came to Scott’s ponies he opted for Jimmy Pigg, Bones, Snippets, Jehu and Nobby. Many of the names had to be modified before they were incorporated. For example, Bones became BOENZ, Snippets – SNIPT, Jehu – JEHOO, Jimmy Pigg – JIPIG, and Nobby became NOBEY. A Commerative First Edition of this chart was presented by Ronnie J. Smith to the Kerry County Museum, in Tralee, on the 100th anniversary of Scott’s safe arrival at the South Pole. My thanks to Ronnie J Smith also.